My boys ages 12 and 5 share a bedroom. It's a huge room so there's plenty of space for both of them but decorating it was difficult. My littlest wanted Star Wars and my oldest wanted Harry Potter or Pokemon. Um, yeah. Not exactly the look I wanted!! So we compromised and I think it turned out pretty well. I have to tell you, with my room makeovers, I don't stage them. Sure, I make beds, pick up legos and straighten pillows but for the most part, what you see in these photos is typically what their room looks like on a daily basis. For their bedding, we used comforters from Target, sheets from Walmart and I made the chevron pillow covers for their Euro pillows and the striped cases for the travel sized pillows. 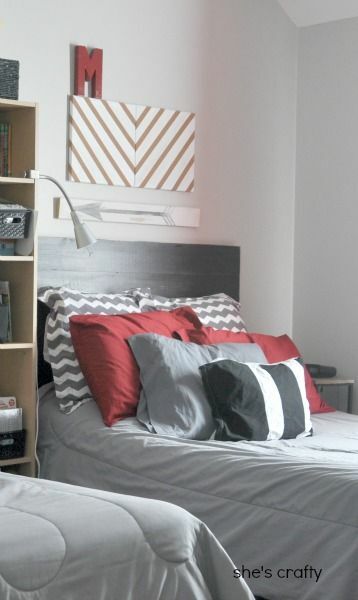 You can also see their headboards, striped bulletin boards and arrow art. 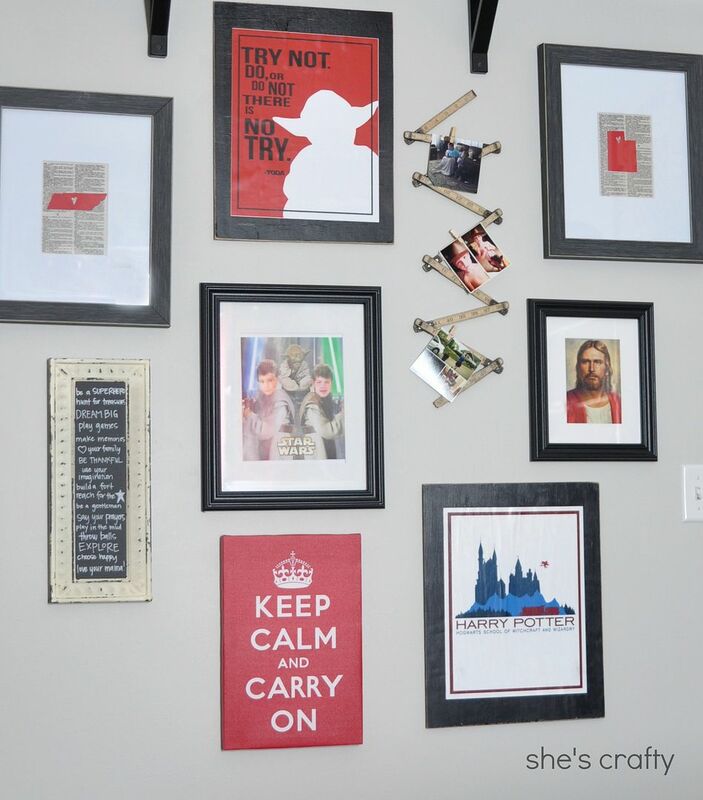 Here is the gallery wall in their room. We used a variety of photos and art in our color scheme. 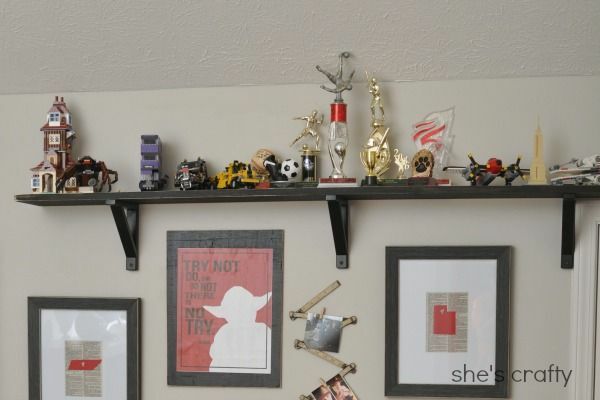 Above the wall gallery is a long shelf for trophies, Lego creations and other boys treasures. I made it from a long 1x6 from Lowes and shelf brackets from IKEA. On the other side of the room, this shelf holds more trophies and treasures and the shelf brackets make a great holder for the curtain rod. This room gets super hot in the afternoon when the sun beats down. 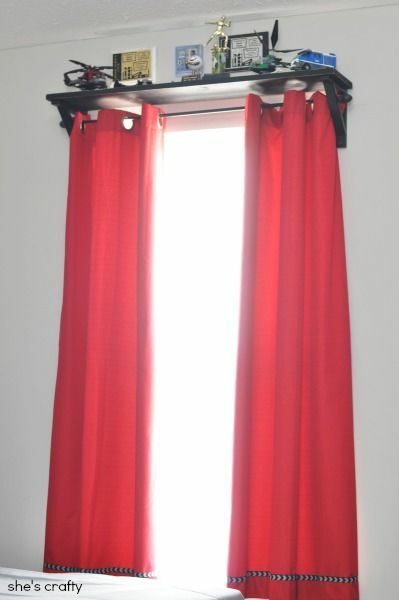 So I put short, red thermal curtains. Short curtains wouldn't be my first choice, but the window is near one of the beds and long curtains would be stepped on. I did add some arrow trim to the bottom of the curtains. I used white panels hung on a tension rod on the inside of the window. We have a large Expedit with bins that hold all of their Legos, Nerf guns, balls etc. 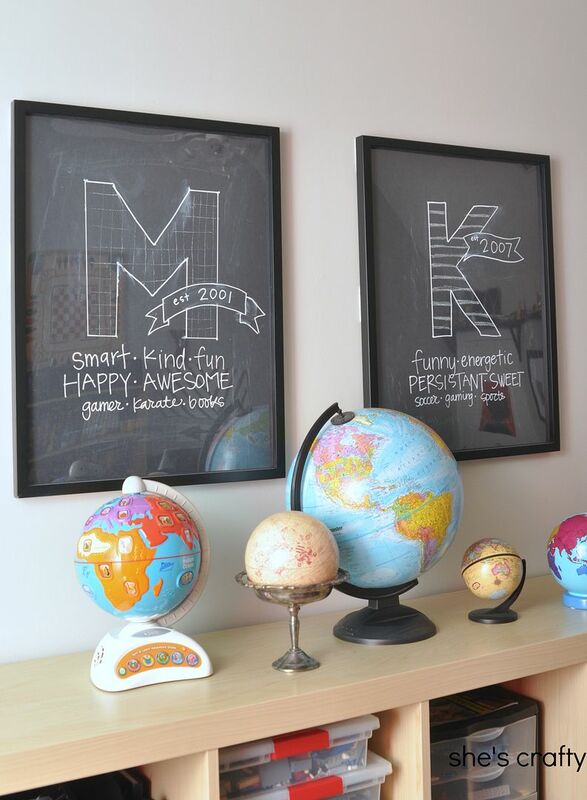 On top is a small collection of globes and some chalk art. We are pretty happy with this room. And it works out pretty well for both of our boys. Super cute!! I love how it all came together!! I can't wait until we have our own place so I can hang shelves and paint!! 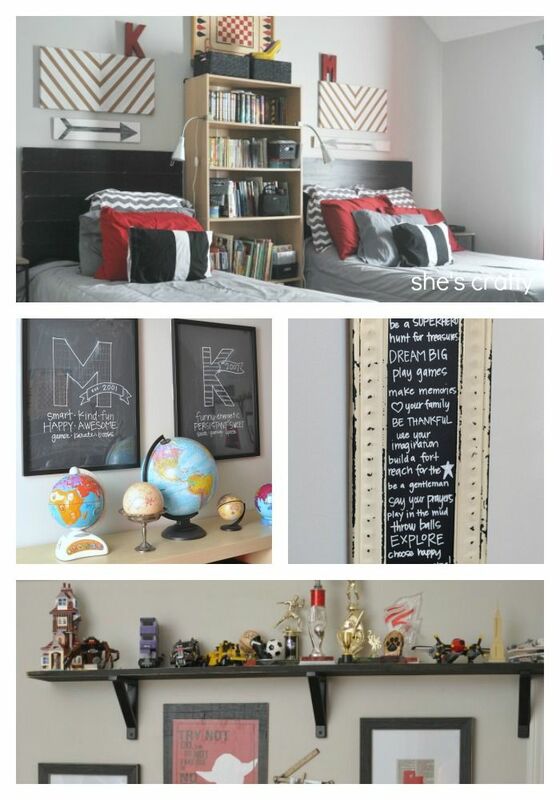 Love this post-classic color mix and so well done:) I'm working on ideas for my "stage-before-tween" boys' room. It's a little baby-ish and generic right now and I'd love for him to feel proud of his room. I'm a huge fan of gray and white with an additional accent color(my son likes yellow, but I LOVE your red!) You nailed everything-I just love it! what a great space! love the globes and the shelf above the window for the always needed storage/display area. well done! 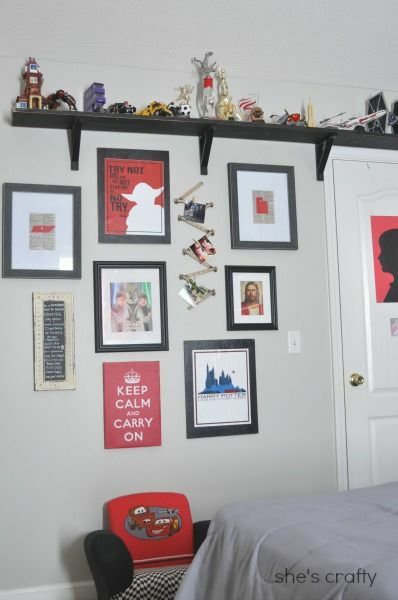 I am featuring your boys room on my blog today. I love it so much. So many great elements. Thanks for linking it up and I hope to see you tomorrow for another party.